In bringing together a group of people to serve alongside of Him as His disciples, Jesus had to know there would be conflicts along the way. His group would not be unlike other groups. Some would want to be recognized over others, some would want to be in control, and some would get hurt by the words or actions of the more choleric members of the group. We can learn some lessons for Church boards, committees, or ministry teams from Jesus’ leadership. Jesus sought to drive the point home about being a servant in a variety of ways. In one situation He placed a young child among them (Mk. 9:35-37) as an object lesson. Another time, He demonstrated servanthood by washing the disciples’ feet, something one would think a servant would do, not their Master Teacher. 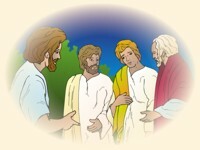 “When he had finished washing their feet, he put on his clothes and returned to his place. ‘Do you understand what I have done for you?’ he asked them. ‘You call me Teacher and Lord, and rightly so, for that is what I am. Now that I, your Lord and Teacher, have washed your feet, you also should wash one another’s feet. I have set you an example that you should do as I have done for you'” (Jn. 13:12-15). Don’t assume people will automatically serve one another and seek the greater good. Even on Christian church boards, committees, and ministry teams, we could find the tendencies for people to want their own way. Some could monopolize, minimizing the contributions of other quieter members. Manipulative and political tactics could be used to sway opinions. Chairpersons could be controlling. Let’s face it: Church boards, committees, and ministry teams are made up of fallen human beings. If being servant-oriented came naturally, the Gospels wouldn’t show Jesus speaking about it and demonstrating it as much as He did. We need to learn from both His teaching and example if we are going to be Christ-like boards, committees, and ministry teams. Next → Next post: Decisions Reveal Faith in God’s Power?